Custom Designs for Ultimate Protection. 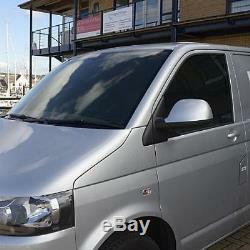 VW T5 T6 TRANSPORTER CAMPERVAN CAB TAILORED SCREEN CURTAIN BLIND 2003+ 160. Allows windows and doors to be opened. Covers front windscreen and both side windows. Our premium tailored screen curtains have been designed to provide complete privacy either day or night, and they are double lined for total blackout. Easy to fit, you will need to fix 4 poppers (2 to each A pillar) all poppers and screws are included and full instructions are provided. We even include a FREE storage case. Fits all T5 and T6 models 2003 to date. Additional charges will apply for the following areas. Republic of Ireland, Channel Islands, Northern Ireland, Isle of Man, Scottish Islands and Highlands plus all other Islands off the mainland. Wherever you live, UK Custom Covers will endeavour to deliver direct to your door. This does not affect your statutory rights. 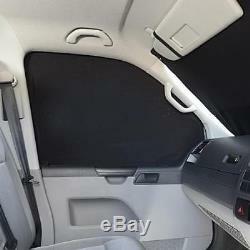 The item "VW T5 T6 TRANSPORTER CAMPERVAN CAB TAILORED SCREEN CURTAIN BLIND 2003+ 160" is in sale since Wednesday, September 2, 2015. This item is in the category "Vehicle Parts & Accessories\Motorhome Parts & Accessories\Campervan & Motorhome Parts". 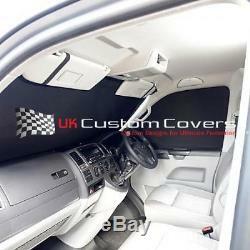 The seller is "ukcustomcovers" and is located in UK, Portsmouth.